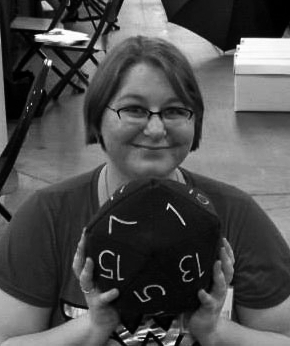 Jen Riehm is a self-proclaimed jack-of-all-art-trades and graduate of the Minneapolis College of Art and design with a BFA in comic art. Though her “day job” as a restitution clerk for the Hennepin County Attorney’s Office is hardly art-related, she also runs her own art studio, Cheeky Neko Studio, featuring all sorts of fun, cute creations. She’s also been cosplaying since 2005. Jen currently resides in Eagan with her mom and three kitties. When she’s not at work or con-hopping for her studio, she enjoys talking about nerdy things, gaming, food (both making and eating), and spending entirely too much time on her computer. Government worker by day, artist by night, and cosplayer in between, Jen is almost always busy with something. When she’s not, she’s probably sleeping.